Our juices and drinks are made from the best ingredients. Always choose your fruits from our Low Glycemic Index list. They help you stay healthy and keep your fat burning up. We all want to burn fat and this is one great way. Most of us find it difficult to have 3 to 4 servings of fruits a day. Just make a fresh juice and you are set. Make that a daily habit and you are on your way to a healthier life style. Fruits are low in calorie and aid in weight loss. Try some Muskmelon drinks even though they are medium Glycemic Indexbut yet they are healthy. On hot summer days have Muskmelon with Cardamom or try Muskmelon with Oranges for healthy breakfast. Amla + Ginger combine to give a super healthy Indian juice. Amla is rich in Vitamin C, which helps to boost your immunity, reduce stress and fight the signs of ageing too. Ginger is anti-inflammatory, and also helps to balance the flavour of amla in this juice. 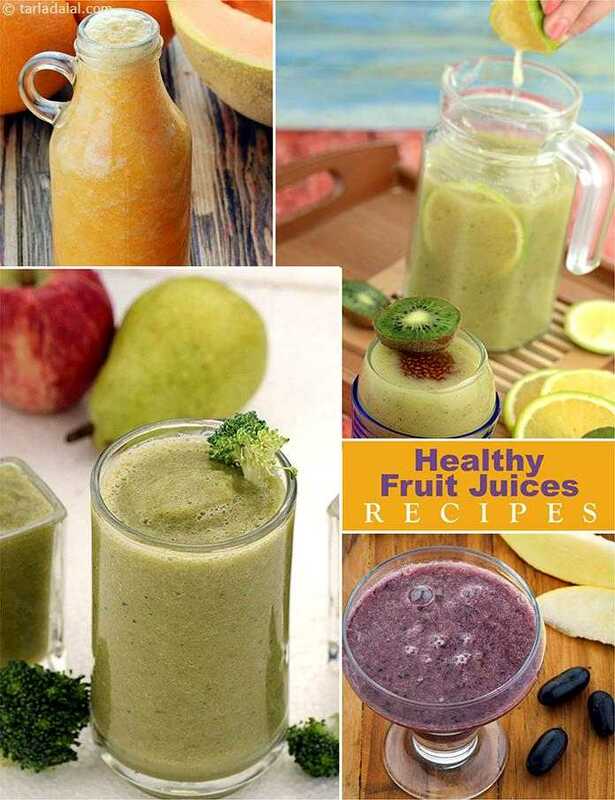 Juicing is indeed a great way to add fruits to our diet, which we need for maintaining good health. To most of us though, juicing is a fairly new idea… here are a few points to help all you beginners out. 1) All fruits should be juiced raw. Always choose fruits that are ripe but firm. 2) Choose only the freshest produce for juicing. Bruised fruits, wilted greens and over or under-ripe fruits will produce juices that are neither tasty nor healthy. 3) Make sure that all the fruits are cleaned thoroughly as they are to be consumed raw. 4) For maximum freshness, flavour and nutrients, cut or chop the fruits just before you are ready to juice them, as nutrients like Vitamin C are lost as soon as the cut fruit is exposed to the atmosphere. Also fruits like apple and banana do oxidise as soon as they are exposed to air. 5) Do not peel or core the fruits as most of the fibre lies just beneath the skin. All leafy citrus fruits (outer peel removed) can be easily passed through the hopper. A word of caution here, seeds of fruits like apple, pear, sweet lime, oranges etc. are toxic and hence should be discarded, so should the top and leaves of carrots. Juices, Smoothies and Drinks is the way to go! See what Indian's are drinking. Also check out our fresh juices, green juices and vegetables juices to live a super healthy lifestyle.